During this time of year, leeks are plentiful. This close relative of the onion and garlic is a great source of vitamins and phytonutrients both of which contribute to several health benefits. Leeks contain significant amounts of Vitamin A, K, lutein, and zeaxanthin. These vitamins and compounds help to support healthy blood cell development and bone health, to promote good eyesight, and to regulate blood flow. One cup of leeks, which is equivalent to one whole leek, only contains 54 calories, allowing you to feel more satiated without consuming a large amount of calories. Leeks have a mild flavor similar to that of an onion and can be added to a variety of side dishes and soups. 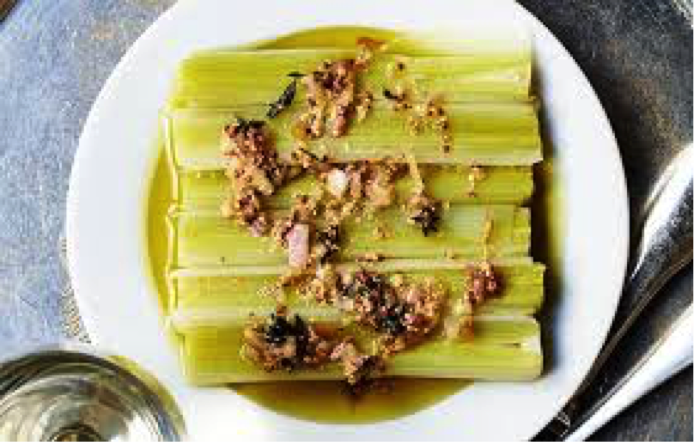 Here are three recipes that will allow you to incorporate leeks into your meals this season! Add leeks; sprinkle with salt and pepper and sauté until leeks begin to soften, stirring often, about 5 minutes. Add mushrooms, garlic, and rosemary; increase heat to medium-high and sauté until mushrooms soften and begin to brown, stirring often, about 7 minutes. Add tomatoes with juice; stir 1 minute. Add barley and 4 cups broth; bring to boil. Reduce heat to low, cover, and simmer until barley is almost tender, about 20 minutes. Add kale; stir until wilted, about 1 minute. Cover and simmer until kale and barley are tender, adding more broth by 1/4 cupfuls as needed for desired stew consistency, about 10 minutes. Toast walnuts in a dry small skillet over medium heat, tossing often, until fragrant, about 5 minutes. Chop very coarsely. Toss warm walnuts with garlic, lemon juice, and 3 Tbsp. oil in a large bowl; season with salt and pepper.